Bells Palsy is a neurological condition where the facial muscles become weak and paralysed due to trauma to the 7th cranial nerve. 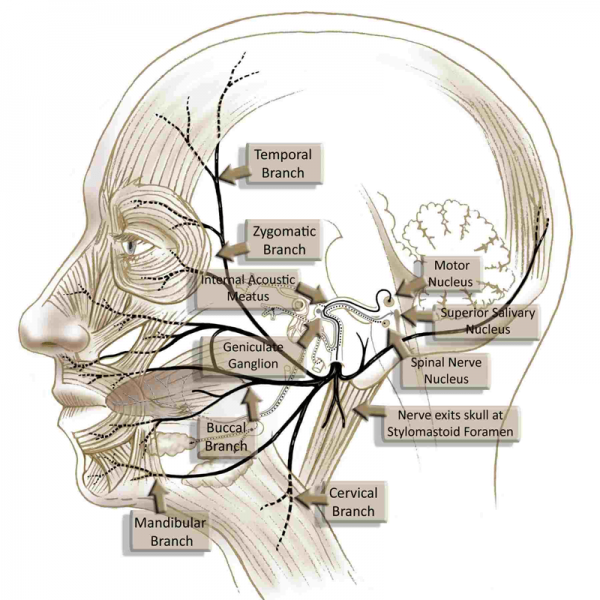 This nerve provides sensation and movement to the whole side of your face and even part of your tongue. When this nerve becomes inflamed, it stops sending signals to the facial muscles and becomes paralysed. In western medicine the cause is unknown, and they say it is non permanent, resolving itself in several months. The problem without seeking treatment, is you are prone to developing it again, and possibly more severely. In China, in the winter Bell’s Palsy is quite common, especially amongst the elderly, who’s immune systems are quite weak. Even though the winters in Melbourne don’t get as cold as in China, people can still develop Bell’s Palsy. I have even seen clients develop Bell’s Palsy in December, during the unstable Summer weather. Although disregarded by Western Medicine, the weather does play a big part in the cause of Bell’s Palsy in Chinese Medicine Theory. Bell’s Palsy is caused by a ‘wind-cold’ invasion, which blocks the circulation of Qi and blood in the superficial meridians in the face resulting in a loss of feeling and muscular movement. The way Chinese medicine describes it, the wind scatters our “Wei Qi” which then allows a pathogen like cold to enter. Our Wei Qi is the equivalent of our immune system, which circulates between the skin and muscle and protects us from the environment. When we are stressed, ill or tired, our Wei Qi is weakened which can allow pathogens to enter. This is why people who are healthy can be around sick people and not fall ill, as their Wei Qi is strong enough to protect them. Like in nature, cold slows things down and can even freeze liquid. When the extreme cold of winter hits a person’s unprotected face then it can causes the flow of energy in the meridians to slow and even stop. This results in the facial palsy and facial paralysis of the muscles. The treatment involves using Acupuncture to try and reconnect the channels on the face to get the Qi and Blood flowing again. Often Moxa or electro-acupuncture is used to help strengthen the treatments to try and correct the facial droop. Though this can sound uncomfortable, remember that the small perk of facial paralysis is you can’t feel anything. It is also important to protect the face from further exposure to cold and wind, and also apply wheat bags and regular massage at home to try and remove the cold and stimulate the facial muscles. Doing facial exercises in the mirror daily by helping the drooped side by hand can also be beneficial. Currently there is only weak scientific evidence of Efficiency for Acupuncture and Bell’s Palsy. This means that though there have been some studies, their quality or methodology is quite poor and the results cannot be regarded as conclusive. If you would like to discuss this further, please call the clinic on 9796 2388. Whilst the underlying cause is the same, the swollen nerve can instead send out pain signals instead of becoming paralysed. This is often though not a common symptom of Bell’s palsy. An extreme version of this is called Trigeminal Nueralgia. Other symptoms can include headaches, facial swelling and pain extending across the jaw and face. This can become a very chronic condition due to the inflamed nerve, so again seek medical advise immediately if you suddenly begin developing facial nerve pain.